Obituary – Murch, Bill Orlean « Perry High School Alumni Association, Inc.
﻿Graveside rites will be at 3 p.m. Saturday at Grace Hill cemetery for Bill 0. Murch, 64, a former Perry resident who died Thursday, Feb. 11, 1993, at his home at Ardmore. Funeral will be at 10 a.m. Saturday at Christ Community church at Ardmore with Dr. Sam Storms officiating. Craddock Funeral home of Ardmore is in charge of arrangements. Casket bearers will be Lenny Coloney, GlenBurns, Jerry Blizzard, Dee Bartgis, Everett Morris and Jim Pemberton. A memorial has been established to benefit the general fund of Christ Community church. 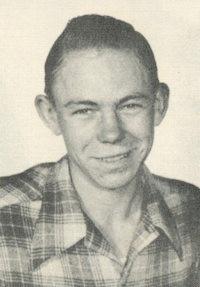 Murch, the son of Bernie Henry and Rita Kay (Knori) Murch, was born at Marshall, Feb. 15, 1928. He and the former Helen Marie Palovik were married at Newkirk, Feb. 26, 1949. Mr. and Mrs. Murch moved to Ardmore in 1970. Murch was area district manager for Unocal Oil Company before his retirement. He was a member of Christ Community church and was an inactive member of the Elks lodge. In addition to Mrs. Murch, survivors include a son and daughter-in-law, David H. and Melinda Murch, Marlow; a brother and sister-in-law, Don and Peggy Murch, Giddings, Texas; a sister and brother-in-law, Margaret and Pete Fisher, Midland, Texas; two grandchildren and several nieces and nephews. Murch was a son-in-law of Charlotte Palovik and a brother-in-law of Duane Palovik and Delores Patak, all of Perry. Other Perry community relatives include an aunt, Gladys Shea; three uncles, Wayne Knori, Martin Knori and George Murch; and numerous cousins.